Eiko received a lot of hairpins for her birthday from her classmates, but even Enami-sensei's sarcastic paper clip gift could be turned into a sentimental accessory. Kamuri made a different kind of gift for Eiko, with all that implies! Meanwhile, Tama continues to remind us that the girls are still wearing their Summer uniforms and their skirts are still short. Eiko stumbled into, or is it the other way around, Enami and her friend while Enami was totally drunk. The morning after served up plenty yuri innuendo for Eiko to play on her teacher, but Enami still "won" with a thousand point move at the end. Eiko tried being playful about the encounter at school, but then she saw Enami-sensei wearing a necklace and she just had to tell someone, Hana apparently, her secret hobby of making fashion accessories. Just more chances for yuri flavor. In case you didn't know, each episode's end credits have a different character popping out of the gacha ball machine. Obviously it was Enami's turn. 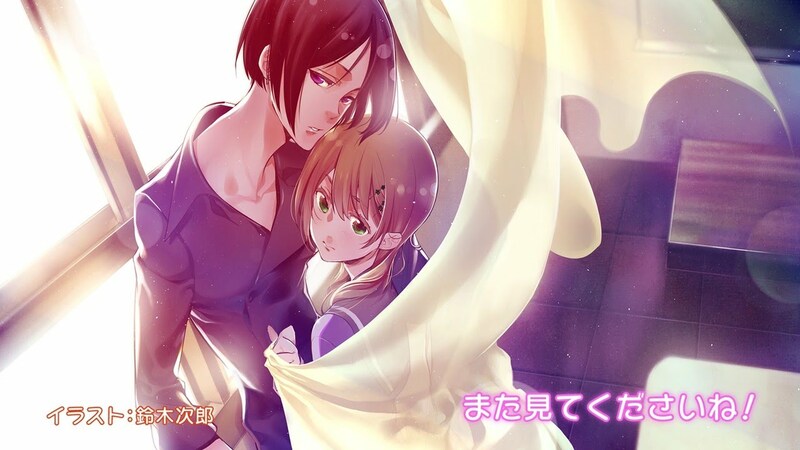 Enami looks awfully shoujo ai masculine in the end card.